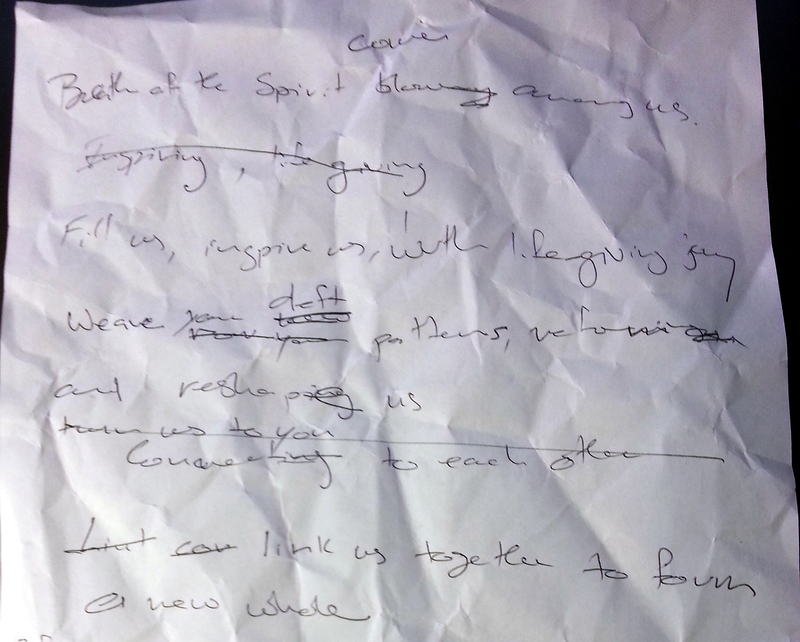 I’ve just written a poem, that became a catch phrase for a concert series, then a litany and then a song. Here’s a description of the creative process. 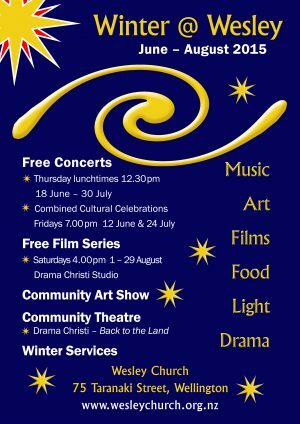 For the past 7 years Wellington Methodist Parish have offered a series of free lunchtime concerts and weekend film showings as part of our Winter@ Wesley festival. Graeme Millar sowed the seeds for W@W when he was our minister for a year. 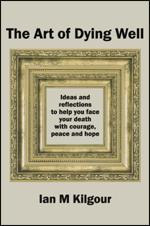 His vision was that we should spread some light and warmth in the gloom and misery of winter darkness. We offer free soup and bread after the lunchtime concerts and have found this to be an effective, gentle way of reaching out to our central city neighbours. The performers also bring their friends along. My wife Heather has managed the concerts from the start and does a fine job of contacting and hosting local musicians and singers at our church. Each year I have designed a poster for Winter @ Wesley. 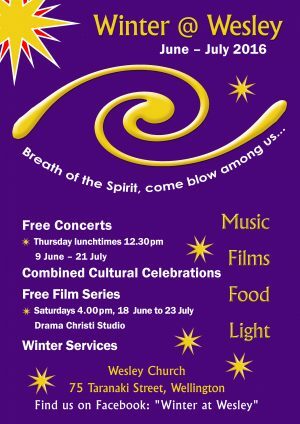 Last year Rev Motekiai Falkatou suggested that we make wind the theme for the festival. With that in mind I created the spiral logo you see in last year’s poster. 10 days ago I was talking with Motekiai again and he said that this year we could focus on breath and wind. That immediately made me think of the Holy Spirit. A couple of days later the phrase “Breath of the Spirit, blowing among us” popped into mind and I grabbed a pen and scrap paper and started to write the poem. 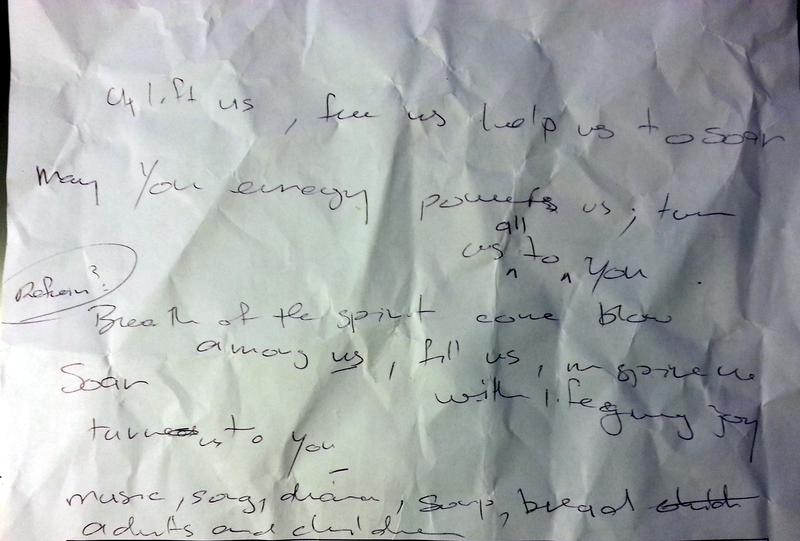 Take a look at the three photos of my scrawled notes which show how the words developed. This took less than half an hour. I started with passive phrases “blowing among us” and “reforming and reshaping us.” When I realised this, I changed them to active voice phrases “come blow among us” and “reshape and reform us.” This gives the words more urgency and implies movement. fill and inspire us, with life-giving joy. link us together to form a new whole. May your energy power us, turn all hearts to you. 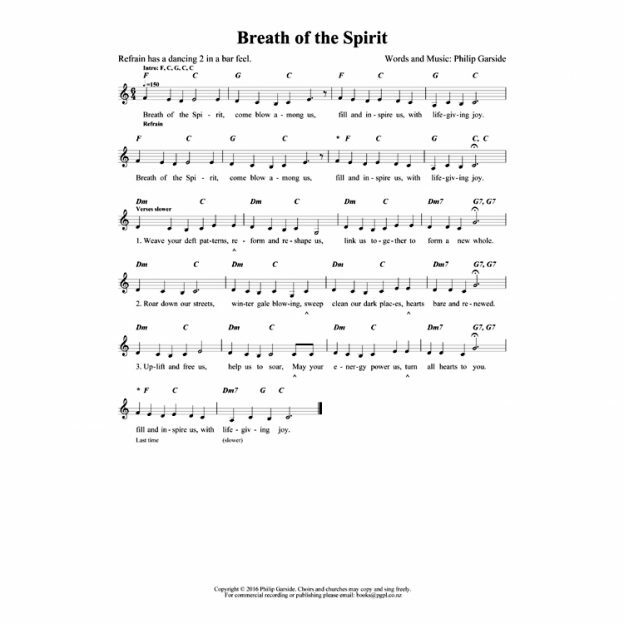 The next step was to include the words “Breath of the Spirit, come blow among us…” in this year’s poster. You will see that I have fitted the words on a curve below the spiral logo. A design tip…The best way to create a poster like this is to use multiple layers in Adobe Photoshop. This enables me to size and position each element separately, until a nice visual balance is achieved. You will also see that I have re-used most of the 2015 poster design, with the biggest change being the background colour, which was blue and is now purple. When the design is finished and approved we will print an A1 poster for the front notice board, A4 and A5 posters and maybe A6 leaflets, all from the same A4 PDF file. Being a worship leader, it soon occurred to me that the poem could be adapted as a responsive litany. It would work as a call to worship or a prayer of approach a bit later in the service. The congregation repeats the refrain and the leader speaks the verses. To which I shrugged my shoulders. Mmm, maybe? But the next day, when walking home from the bus stop after church, a bit of tune came into my head from the Finale of Jonathan Berkahn’s The Third Day, Easter cantata, which I have sung many times with Festival Singers. It fitted the first few words of the refrain. When I got home I got out the litany and started to sing melodies to the words – the first step in composing. Having convinced myself that I had some good melody ideas, the next urgent step was to write out the musical notation. Urgent, because if I don’t capture the musical ideas quickly I will forget them. 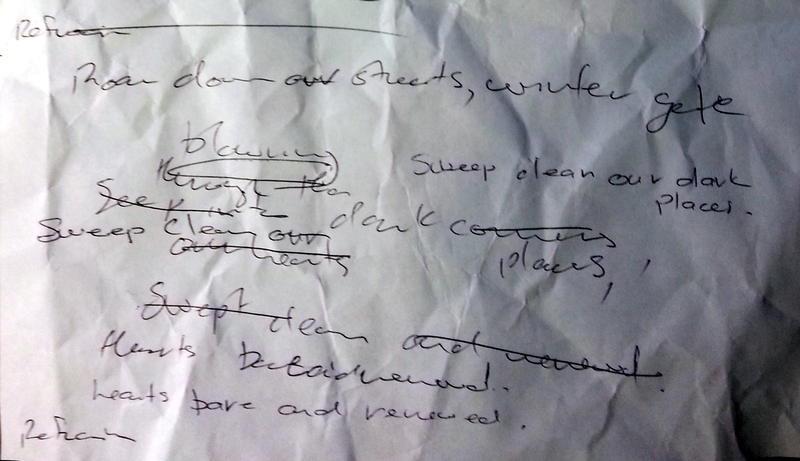 I don’t write the notes by hand onto lined manuscript paper. Instead I use music notation software – Noteworthy Composer (US$49). This lets me enter a few notes and I can then get the software to play them back. Often I enter the wrong pitch or length of a note, so hearing the melody played back lets me check what’s written down against what’s in my head. The other tool I use at this first draft stage is an electronic keyboard. I have an old Yamaha keyboard which can sit next to my screen and computer keyboard. 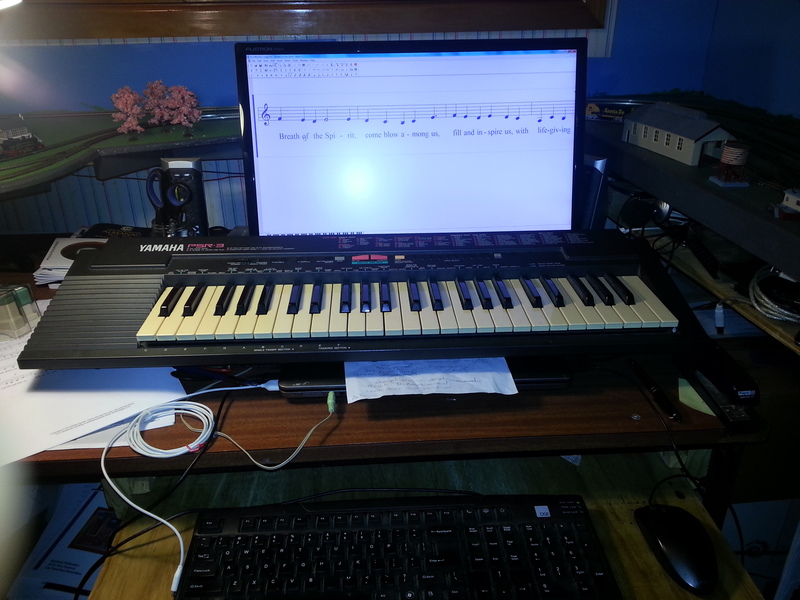 I use the keyboard to try different patterns of notes for the phrases of the song, and keep fiddling until I’m happy. After I have entered all the melody line into Noteworthy I print out a first draft of the sheet music. Then I get out my guitar and experiment fitting different chords to the melody, and write them by hand onto the music. Then I sing through the whole song, ironing out the rough edges until I’m happy. While I have Grade 7 Royal Schools music theory and have sung in good choirs for many years, I can’t “hear” the underlying harmonies and chords when I’m writing a song. Heather and my son Christopher do have that ability, which I greatly admire. I just have to bash my way through. I accept some suggestions and tactfully decline others. Another couple of rounds of editing the sheet music follow. And, we are done. The whole creative process took 3 days. Note: The song is set fairly low which will suit basses like me and altos. If you prefer a higher setting, transpose it up a tone or two by using a capo on your guitar. Then publish abroad God’s glorious name! Now I get to share the poem, litany and song with the rest of the world. I’ll make them and this story available as a blog post on my website. (This is it!) I’ll share that post on Facebook and Twitter to help build my brand. I’m going to sing the song when I perform the first concert of the Winter@Wesley series on 9 June. I’m going to introduce it to Festival Singers when I lead the closing devotions on Monday night, and to our 10am Singing Group at Wesley. I’ll also do a post on kiwiconnexion.nz and record videos to post on You Tube performing the poem, litany and song. People, choirs and churches are free to use these in worship or anywhere else. Please just credit me as the composer/writer. Interactions with other people were important. Motekiai sparked, “Spirit.” My poet friend liked the words and said, “Song?” Heather helped to polish a rough diamond into something shinier. It’s good to recycle and re-purpose an idea. A simple devotional poem, can be extended for use in worship. I have also in this case borrowed the first two bars of the tune from Jonathan. I don’t think he will mind. I wrote the words and the song because I felt inspired to do so. I like making things and the process somehow comes naturally to me. I’m not the best poet, liturgist, composer, singer or musician in the world. But I have enough skills, and the confidence to use them, to produce worthwhile creative work. It would be silly for me to be held back by waiting until I achieved perfection, good enough will do. Make it, share it, see what happens. This entry was posted in What I've been up to, Worship & Music and tagged creative process, free song, Holy Spirit, litany, Methodist, New Zealand, poem, song, video clips, worship resource, worship resources on May 29, 2016 by Philip Garside.